Being fascinated by craftsmanship, Barbara Broekman constantly explores more possibilities for new applications of her work. As a result Broekman developed Murals: monumental prints on polyester, based on her autonomous works. 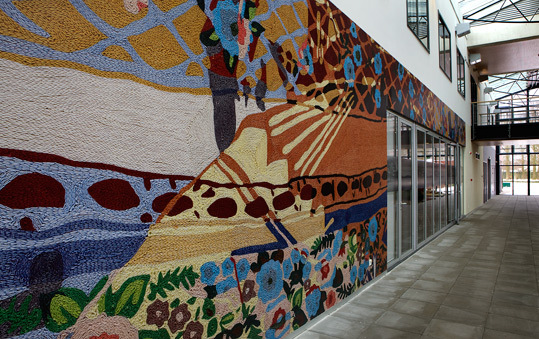 In assignment for addiction clinic Novadic Kentron, Vught, she created a Mural covering large parts of the main wall at the entrance of the head quarters. The foundation for this mural is Broekmans’ hand embroidered artwork ‘North American Indians’. The work is part of the ‘Mother and Child’ series, in progress since 1996. For each of the thirty works, Broekman chose an image of a mother and her child. She created ‘double images’ by interweaving them with landscape elements, ornaments and textile patterns which she found characteristic for the country of origin. Intuitively, complex compositions came to existence, full of colour and metaphors, with a certain degree of abstraction. The original embroidered works are produced manually in India (by men! ), in a specialized company. After an intense and extensive production process, the handwork looks alive and organic. As it were, the energy can still be felt. For the creation of the murals, details from the original embroidered work were photographed and strongly enlarged. The fragments were carefully selected for their abstract quality, while the image still remains recognizable. Zooming in on the miniscule stitches, makes the production process even more visible. The embroidering itself becomes the subject. Stitches become ropes and strings overlapping each other, create a three dimensional composition of a meditative quality. The unconditional connection between mother and child is a precious and emotionally charged phenomenon for Broekman. This theme is closely connected with the daily care Novadic Kentron provides. The many colours leave a positive impression, stimulating clients to change their cheerless course of life.